After a terrible car crash, this family's puppy escaped and ran away out of fear. 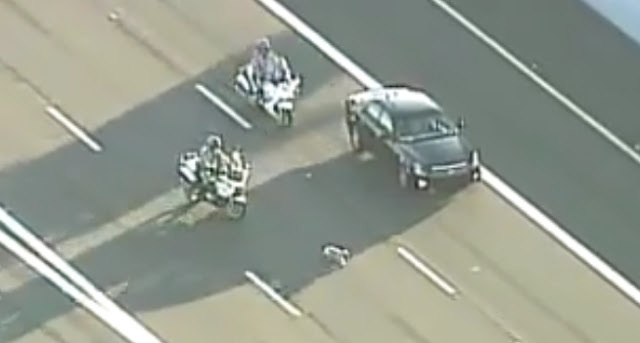 But two police officers tracked him down and saved his life on a very busy highway. Great job to the officers! Car Accident? What to Do if Your Dog Is Injured: After a car accident or similar trauma, a dog may be in a state of shock. It will be frightened and possibly injured. A dog's first instinct will be to run and hide. It will not understand that you are trying to help and may become aggressive, even to people it knows. Despite the difficulty, it is important that you restrain the pet and put a dog muzzle on it so it can be safely taken to a veterinarian. Start by talking softly to the dog. Approach it slowly. Do not make any sudden movements. Stop your approach when you are about a foot away from the dog. Extend your closed hand, knuckles upward. If there is no aggression, pet the dog with your closed hand. If the animal struggles, talk softly for another minute and try again. Before administering first aid, it is important that you muzzle the dog. Even a gentle dog, if frightened, can take a bite out of your arm. In an emergency, a muzzle can be made from a piece of gauze, a strip of sheet, your necktie or even a sock. With one end of the cloth in each hand, lay it across the dog's nose, as close to the eyes as possible. Wrap the cloth completely around the nose and tie firmly beneath the jaw. Pull the ends back on each side of the dog's neck and make a tie behind the neck. Responses to "Police Officers Rescue a Runaway Puppy on a Busy Highway"